The story repeats itself. Its arrival at the River Plate has also been controversial. The bandoneon is the history of a failure born in Germany which ended in the porteño suburbs. It was created by Hermann Ulgh in 1835, with the purpose of spreading sacred music in open spaces and replacing the organs. But it did not work. After decades, a manufacturer sold these instruments with the initials AA, which later passed onto being called Vertagh Heinrich Band, assembled at the Band Union workshop. This workshop gave origin to its successive names: bandunion, bandonion and finally bandoneón. Sebastián Ramos Mejía, a black man who led a yoke of horses at the Transwald and who would get to play in lousy coffee-shops, introduced this sacred instrument to our country back in 1862. 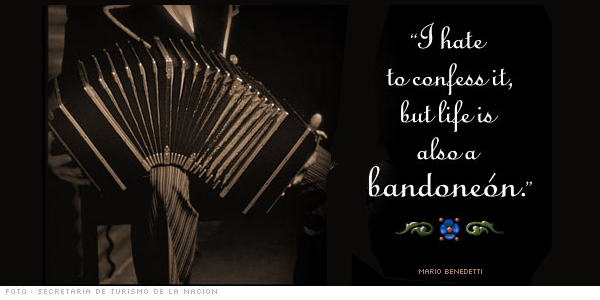 Maybe that is why the bandoneon prints some liturgy and some of its severe air. So particular is it that its expressive possibilities permit everything from the high tunes of the clarinet to the clavichord. Loyal companion of all pains, your querulous voice insufflated another spirit into tango. Confessor when the soul revolts, bandoneon, when you open up, your music throws light upon everything around, but when you close, you are dark and insolent. Between the beatitude and the wickedness, learning to play you demands the intelligence of the insane. Oddly enough, most tango men have been bandoneon players. The ones who used to know less about the genre became the best connoisseurs, maybe because the bandoneon encloses a small orchestra in itself. Oscar Zucchi, author of a work about the evolution of tango through its great bandoneons, considers that the most virtuous of all the masters was Roberto Di Filippo, and also highlighted Eduardo Arolas, Pedro Maffia, Pedro Laurenz, Aníbal Troilo, Leopoldo Federico, and other excellent creators. Also Federico Scorticati, Armando Blasco and Gabriel Clausi caused amazement as soloists. And he cannot omit Astor Piazolla, who set his particular stamp on the history of the bandoneon as an instrument of tango. When she arrived... I heard you laugh...! When she left... your song cried...! is concealed within your keyboard. the dark flame of her absence, and of my love. don't go on dripping gloom. How your moan grieves me. We shouldn't lose our head. in the corner of dead dreams. We must know how to forget. When she arrived... window of love...! When she left... voice of bitterness...! and I made a shroud out of your blue shawl. that we raised to your bandoneon lullaby.